By the end of the 19th Century the numbers employed in farming in Scotland were decreasing. New farm machinery had reduced much of the need for manual work though farm tractors had not yet made their appearance. 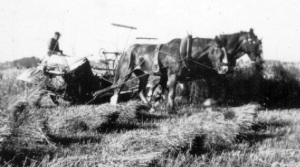 The farm implements were drawn by horses, so good horses were essential for a well run farm. Just as important was a good ploughman. It was a comparatively well paid job but with long hours of demanding work. “In summer he is due at the stable at 5am. If his horses have been out at grass all night, his first duty is to catch and bring them in. There is generally an hour’s work mowing and bringing in grass for the stables. The stables are to clean out and the horses to groom and feed. He goes home to breakfast about 6.15am, returning at 6.45am, at once harnesses his horses, ready to leave the stable at seven sharp. He works till twelve noon, when he unyokes and brings his horses in, waters and feeds them, then goes home for his own dinner. Returns to stables about twenty minutes before two, harnesses his horses, and leaves the stables for afternoon work at two sharp. Works till six, which is ‘loosing time’. Brings his horses in, takes off harness, gives them a rub over with brush or wisp, waters them, and gives them a feed of oats. Either goes off to his own tea, returning in half an hour to put his horses out to grass for the night, or quietly waits until his horses have finished their feed, then turns them out, and his day’s work is finished. On farms where the horses stand in stables all the year round the men return at 8pm, give them a thorough grooming, do up the stables, and fill the racks with grass, vetches or hay. The 8 o’clock stabling takes from 30 to 45 minutes. In winter time those who breakfast before going to work appear at stables at 6am. Clean out the stalls, feed the horses, do any odd jobs about the steading, sometimes clean out the byres, and so on till near daylight, then they harness their horses. A few minutes before daybreak they leave the stable door for the field, there they remain till 12 noon. Their object being to have nine hours actual work in the field, they occupy no more time at home than is required to take their dinner, returning at once to the stables and leaving for afternoon work at 1pm. They work till the light dies out, the horses are then put in, and a little corn or hay given. If they are cool, a drink of water precedes the corn and hay. The ploughman then goes home for supper, returning at 8pm to groom the horses and do them up for the night. This occupies from half an hour to threequarters of an hour and concludes the day’s work.